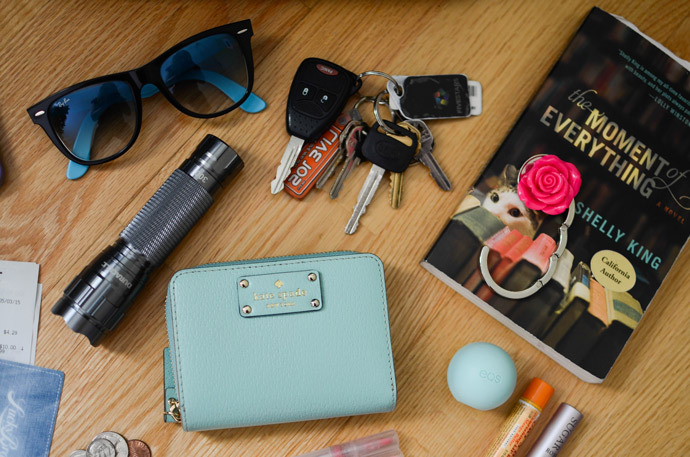 + Kate Spade wallet - Totally love my Tiffany blue wallet. It is the perfect size & adds a girly pop of color! + Keys - You know, not gonna get far without those babies... I definitely often lose track of them though! + iPhone 5s - My lifeline! + Ray Ban sunglasses - For those sunny CA days! These are by far my most favorite sunglasses I have ever owned. 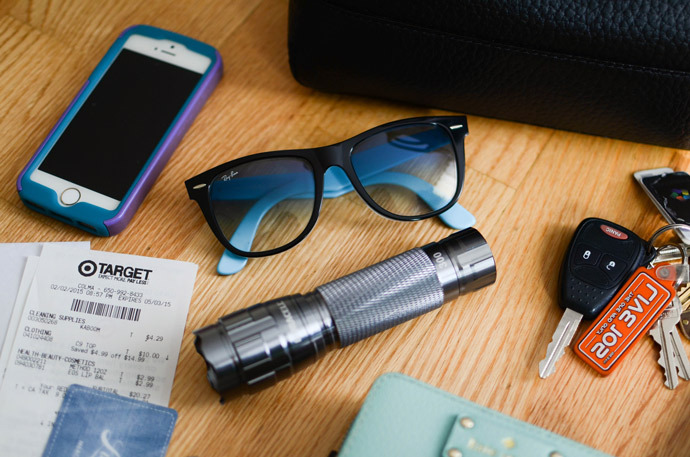 + Flashlight - For when I'm walking to my car or house at night, just to be on the safe side. + Purse Hook - I love how this hooks onto a table & holds my purse so I don't have to put it on the floor or hold it on my lap! 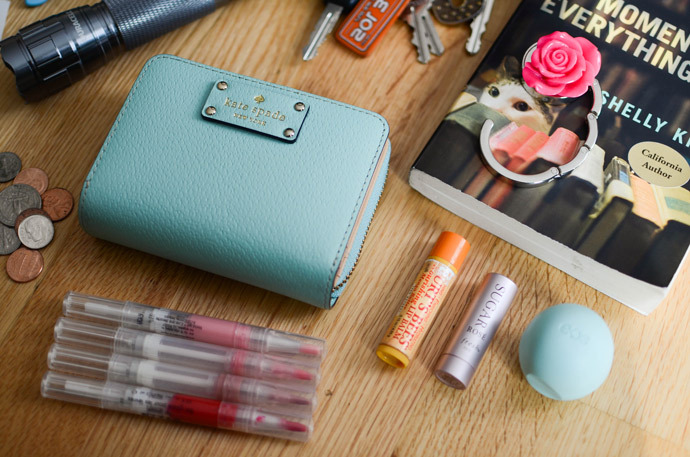 + Lots of Lipgloss - I constantly misplaces these, but they somehow all end up in my purse. More choices at least! I love the Stila twist ones. + 3 Types of Lip balm - I'm rather indecisive. I've always loved Burt's Bees, but recently got a lovely Sugar Rosé tinted lip balm for Christmas & Dai got me my first EOS egg thing the other day. + Book - I've been trying to read more, so I keep a book with me all the time! + Loose Change - It always ends up floating around at the bottom until I dig it out & put it in a jar. + Lucky Brand Gift Card - This somehow never made it into my wallet, but was just thrown in my bag. Oops! + Money Budgeting Envelopes - I've been using envelopes lately to keep track of my money & it has been going pretty well! 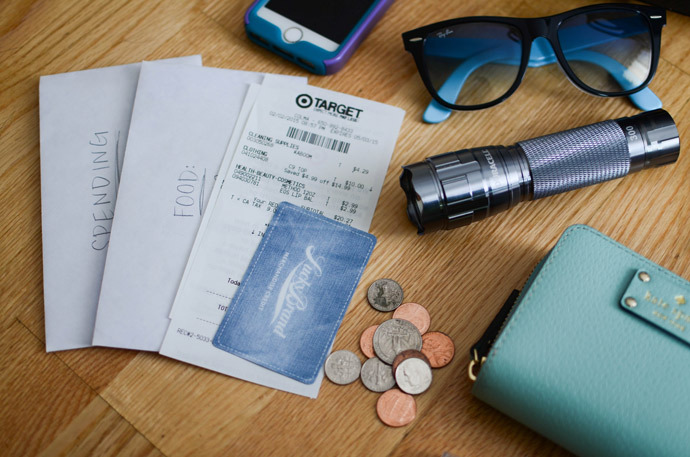 + Target Receipt - From a trip to the store the other night! One of those things that just float around. 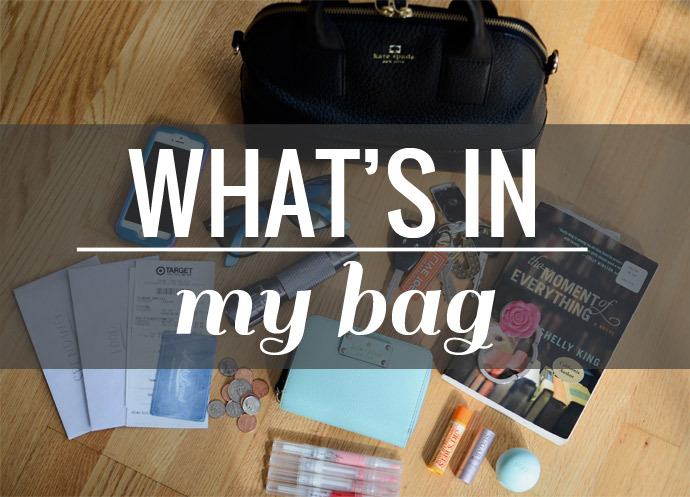 What are must-haves in your bag? That book in your bag looks interesting. I also am one of those people who see to it that I have a book in my bag, or at least a reading article in my phone. It's a huge time and life saver especially when you'll be in a long queue or be in for a lot of waiting. I am one of those sick and twisted people that loves these too!! mine is so full of receipts too! I know, right? Like, what is it that makes it so fascinating? 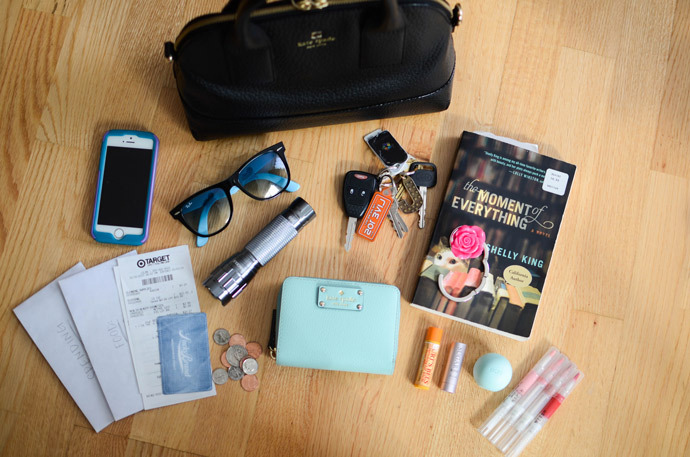 Yes, you should do your diaper bag! I also find those interesting even though I do not have a baby or any plans for a baby in the near future. Sick. Thanks Leah! Haha yeah things can get messy sometimes for sure! Thanks Lux! You are so right! It is definitely nice to have something to read to kill time.